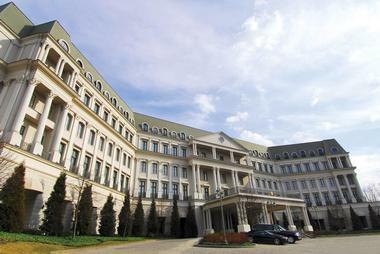 Located in the Laurel Highlands of Southwestern Pennsylvania, Nemacolin Woodlands Resort is the perfect destination for those looking to get away from it all and enjoy time with family and friends, those wishing to pamper themselves at a luxury spa, and engage in outdoor activities in a beautiful setting. 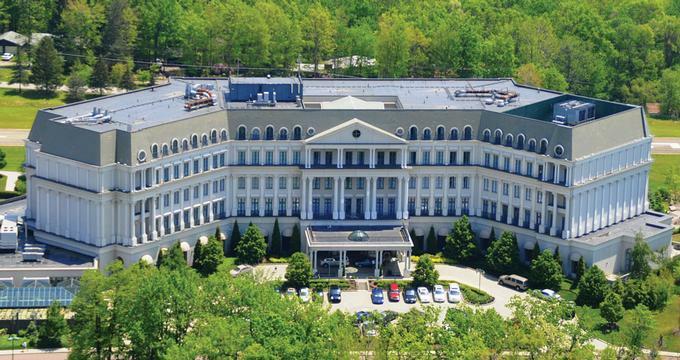 Nemacolin Woodlands has a total of 320 rooms, which cover a variety of lodging options. Falling Rock boutique hotel, which is a tribute to the architectural style of Frank Lloyd Wright, blends functionality with natural surroundings, and boasts 42 luxury rooms with 24 hour butler service, 200 gallon soaking bathtubs, 10 option pillow menus, a heated outdoor infinity pool, and milk and cookie turndowns. 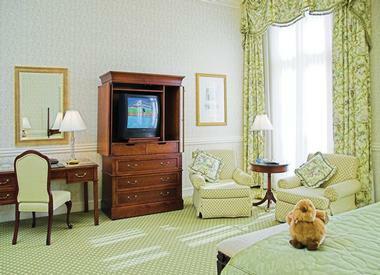 Chateau Lafayette, inspired by design of Ritz Paris, offers guests spacious rooms and suites with vaulted ceilings, crystal chandeliers, and large, jetted soaking tubs. 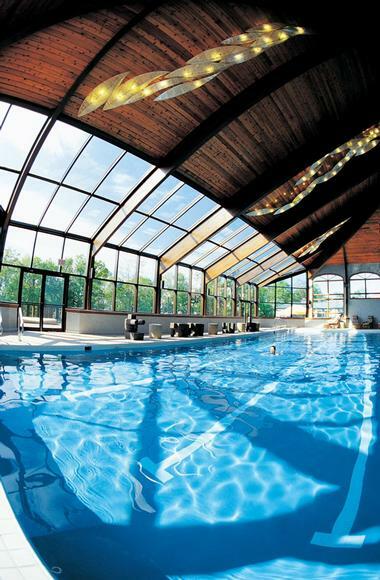 The Lodge is an English Tudor-style hotel with the inviting air of an English country inn. The two bedroom townhomes are available for those who desire a more intimate setting to share with friends and family. Private Homes are also available, which can offer accommodations for two to 20 guests, and feature full room and bell service, a pet-friendly atmosphere, as well as butler service for an additional charge. Maggie Valley RV Park offers access to the amenities of a luxury resort, with the convenience and comfort of an RV. The RV Park has 20 paved parking spots, with picnic tables and a wood-burning fire pit, as well as cable TV, water, electric, and sewage hookups, telephone jacks, and high-speed Internet access. Nemacolin presents guests with a variety of restaurant options. Autumn offers diners a relaxed atmosphere and features multi-course menus highlighting regional fare, prepared with locally sourced ingredients. The breakfast menu includes staples such as pancakes, French toast, and a variety of omelets. The dinner menu offers such options as Popcorn Shrimp with turnip, parmesan, watercress and truffle butter; Chilean Sea Bass, with old bay aioli, and relish jam; Kale Ravioli, with shitake, kohlrabi, charred garlic and lemongrass; and Caramelized Phyllo & Pumpkin Mascarpone Napoleon, with spicy pecans, candied ginger, and maple syrup. The restaurant offers a gluten-free/vegan/vegetarian menu, as well as a children’s breakfast and dinner menus. Lautrec, which is decorated with authentic Henri de Toulouse-Lautrec lithographs, is an Automobile Association of America Five-Diamond restaurant, as well a Forbes Five-Star restaurant. The menu features a European-style cuisine with a prix-fixe menu format, and a resident sommelier is available to assist diners with wine pairings. Menu selections include an Artisan Cheese Plate with fruit preserves, marcona almonds, honeycomb, and sea salt lavash; Winter Citrus Salad with roasted beets, shaved onion, fennel, hazelnut, served with burnt honey vinaigrette; Sweet Potato Agnolotti with roasted red onion, jalapeno infused honey, pecan, feta saldana, and cilantro; Grass Fed Wagyu with creamed local spinach, Oregon chanterelles, Amish feta, bacon gastrique; and the Choco Taco, a cashew-crusted waffle with chocolate covered banana, spiced fudge, and rum chata ice cream. Aqueous is an upscale steakhouse that features American cuisine, utilizing the best domestic ingredients, with a special emphasis on local fare and seasonal ingredients. Menu options include Foie Gras, seared and whipped with pecan granola, pumpkin butter, and bittersweet chocolate; Harvest Salad with baby arugula, roasted pears, pickled apples, sunflower kernels, Beemster, and poppy seed vinaigrette; the Forty Eight Ounce Certified Angus Tomahawk Ribeye Chop; and the Cheesecake Cigar with toasted phyllo, caramelized banana cheesecake, strawberry gelato, and hot toddy. Aqueous also provides gluten-free and children’s menus. The outdoor Sunset Terrace (available seasonally) offers guests a casual approach to fine dining. Menu choices include the Lettuce Summer Roll with sesame tuna, chilled noodles and Gochujang aioli; the Pittsburgh Salad with artisan greens, tomatoes, cucumbers, pickled onions, cheddar, and house cut fries, served with a basil buttermilk dressing; Amish Vegetable Wrap with grilled local vegetables, herbed quinoa, marinated olives, and feta, served with a lemon oregano vinaigrette; and sorbets such as Moscow Mule or Prickly Pear Margarita. Sunset Terrace also offers a children’s menu, with kid-friendly options such as hamburgers, grilled cheese, and hot dogs. 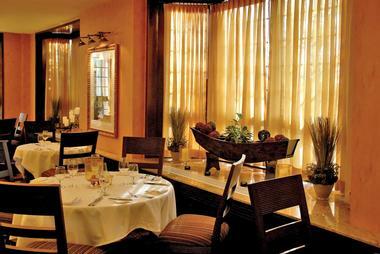 The Tavern offers guests pub-style fare for lunch and dinner in a relaxed atmosphere. Seating options include the bar, inside the restaurant, or the sidewalk café located near the 8500-gallon saltwater aquarium – a favorite with children. The menu includes fare such as the Harvest Salad, topped with feta cheese, tri-colored quinoa, balsamic roasted beets, roasted root vegetables, dried cranberries, and spicy roasted pecans; the Dagwood Sandwich, a triple stack of ham, turkey, roasted beef, Swiss cheese, cheddar cheese, cucumber, red onions, lettuce, tomato, and dijonaise on sour dough; Cocoa Seared Scallops, with bacon risotto and fresh vegetables coated with a chili pepper infused oil; the Coca-Cola Float with vanilla vodka, coke, and vanilla ice cream; and Pumpkin Tiramisu with ginger snap crumble, and a whiskey sauce. Gluten-free menu options are available. The Caddyshack features a private smokehouse and rotisserie, providing guests with signature barbeque dishes and family favorites. Menu selections include Appalachian Trail Chili, topped with sour cream, cheddar cheese, and scallions; Watermelon and Feta Salad with pickled onion, cucumber, tomato, and crumbled feta, served with cantaloupe mint vinaigrette; Pulled Pork with barbeque sauce, white cheddar, and coleslaw, served on an onion roll; and Pumpkin Pound Cake, served with vanilla bean mascarpone mousse, and cranberry compote. A gluten-free menu is available. P.J.’s Ice Cream & Pizza Parlor provides a variety of pizzas, salads, and 1950’s style ice cream to guests, who are seated in vintage automobile booths. Otis & Henry’s serves classic American comfort food in a relaxed setting, complete with a brick fireplace. Menu selections include Grilled Bread with a garlic, tomato, mozzarella relish, and a mascarpone spread; Shrimp Po’ Boy with buttermilk battered shrimp, lettuce, tomato, pickle, and a Cajun remoulade; and Harvest Salmon with sweet potato hash, and apple butter. Elements, located in the Woodlands Spa fitness facility, offers guests light fare with an emphasis on health. Menu choices include Melon Gazpacho; the Nicoise Wrap with mixed greens, green beans, asparagus, olives, grilled tuna, and quinoa, served with a white balsamic vinaigrette; The Pompe with avocado, lettuce, tomato, Swiss cheese, cucumber, and garlic Aioli, served on toasted sourdough bread; Baby Spinach and Berry salad with goat cheese and red onions, served with a walnut vinaigrette; as well as fresh fruit smoothies, fresh pressed juices, and yogurt parfaits. Available seasonally, Mulligan’s provides a quick bite for golfers tackling the Mystic Rock Golf Course. Menu options include wraps and sandwiches. Domestic and imported beer are also available. Orville’s, another seasonal eatery, is located in the field club, serving guests light fare such as sandwiches, burgers, and chili. Nemacolin not only boasts the largest wine cellar in Pennsylvania, but also offers guests seven distinct bars and lounges to choose from. The Amber Lounge offers guests breakfast and lunch menus. The Tea Lounge, located in the Chateau Lafayette, serves a traditional English tea with pastries. The Cigar Bar offers a 1920’s speakeasy-style bar, serving the finest bourbons, scotches, and cognacs, as well as Prohibition-style cocktails. The Lobby Bar provides a selection of fine cordials and cocktails, as well as fare from Lautrec. The Tavern Bar is a popular nighttime destination, with multiple televisions, and four billiards tables. The Oak Leaf Bar (open seasonally) offers guests a chance to socialize on the patio, or by the fire pit. The Lone Wolf allows guests to unwind with cocktails, live entertainment, and a dance floor – located right inside one of the resort’s featured evening diversions – the Lady Luck Casino. The Woodlands Spa offers traditional massages, such as Swedish, hot stone, pregnancy, and deep tissue, as well as innovative massages such as the Dream Catcher, which blends Native American and ancient Hawaiian techniques to provide relaxation and healing from within. The spa provides also provides treatments such as reiki, cranial sacral therapy, and reflexology. Body treatments include the Woodlands Cleansing Wrap, which utilizes a mineral rich serum to eliminate lymphatic sluggishness, arnica oil to ease muscle pain and inflammation, and a sweet birch rub to relieve stress and address chronic muscle aches. Other menu options include paraffin wraps, body polishes, hydrotherapy, and scrubs. Salon services such as manicures and pedicures, makeup application, eyelash enhancement, haircuts, and hair styling are also available. The Grove offers spa services to children from ages 5 to 15. The Fitness Center offers personal training, and classes such as yoga, Pilates, and toning. 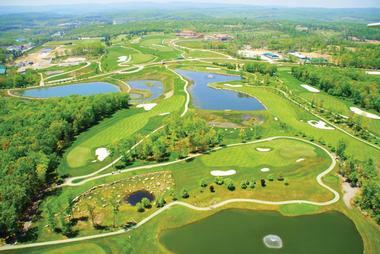 Nemacolin’s golf course, Mystic Rock, was designed by Pete Dye, and is a par-72 course, with a 77 rating and a 149 slope from the championship tees, which highlights the natural beauty of the Laurel Highlands. 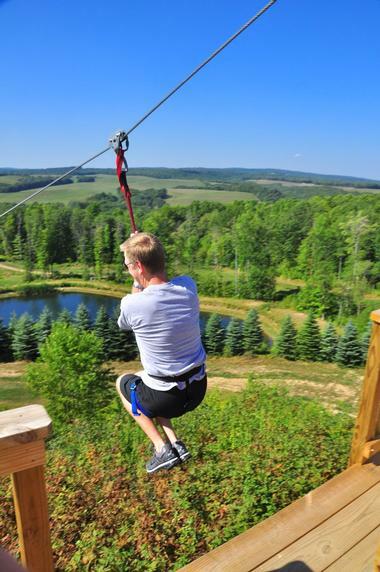 Other sporting activities at Nemacolin include clay shooting, fly fishing, guided hunts, archery, an off-road jeep driving academy, biking, hiking, a climbing wall, ziplining, paintball, tennis, horseback riding, carriage rides, and dog sledding. Winter activities include skiing, snow tubing, and sledding. Activities for children include a ropes obstacle course, complete with a zipline; the Hardy Girls gymnasium, which includes a foam pit, trampoline, two balance beams, uneven bars, exercise spring floor, parallel bars, adjustable training high bar, tumble track, vaulting table, pommel horse, rings, numerous safety landing mats and training aids, barrels, and wedges; Kidz Club, which is available for full or half days; and Kidz Night Out, which includes an evening of crafts, swimming, games, mini-golf, and movies. For corporate meetings, Nemacolin offers the newly remodeled Executive Conference Center, which offers 25 meeting rooms, an exhibit area, a business center, a 200-seat lecture hall, and two ballrooms. Nemacolin provides Certified Wedding Designers to help plan guest weddings, including flowers, food, salon services, entertainment, and theme event décor. Numerous indoor and outdoor event spaces are available, with ample space for anything from an intimate gathering to a grand affair. Doubles start at about $340. 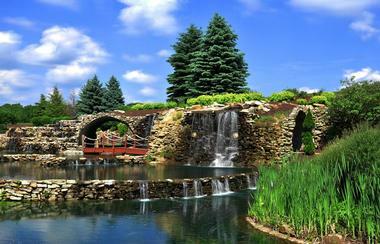 Find more great weekend getaways from NYC, Romantic Weekend getaways in PA near me.